Got a spare hour or two on Saturday, 24 November? Books for London is teaming up with the London-based CollectConnect group of artists to release copies of their newly published FreedBook across the Books for London network. 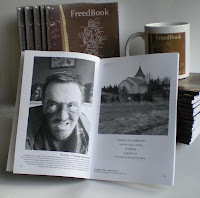 FreedBook is a 72 page softback book, containing 68 one-page stories from 50+ artists. There were 100 copies printed in the First Edition. Each book is individually numbered, and each is signed by at least one of the artists. We’re going to be roving across London visiting as many book swaps in train stations as we can. It will be the first time the Books for London network has really been linked up in a big way. The FreedBook collective will also be giving away Freedbook mugs, t-shirts, decals, diaries, keyrings and cotton bags for those who come along – so there’s even more reason for you to come! Can’t make it on the day? You can buy the FreedBook for the small price of £4.99 – details here. Nasty wet day for it but the crowd rolled up to leave the first book and, fortuitously, so did a donor with a bag of books including a novel in Portuguese and many about either Japan or computer programming and sometimes both.